Twice a year, and most recently on April 28th, the Drug Enforcement Administration (DEA) sponsors National Prescription Drug Take Back Day. This national event offers a safe disposal method for expired and unneeded prescription drugs. This effort is part of the national fight against opioid and prescription drug abuse, but it’s also the best way to protect children, pets and the environment from loose meds. 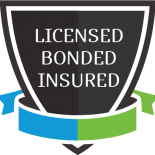 However, drug safety is important even if loved ones need all the prescriptions they have on hand. 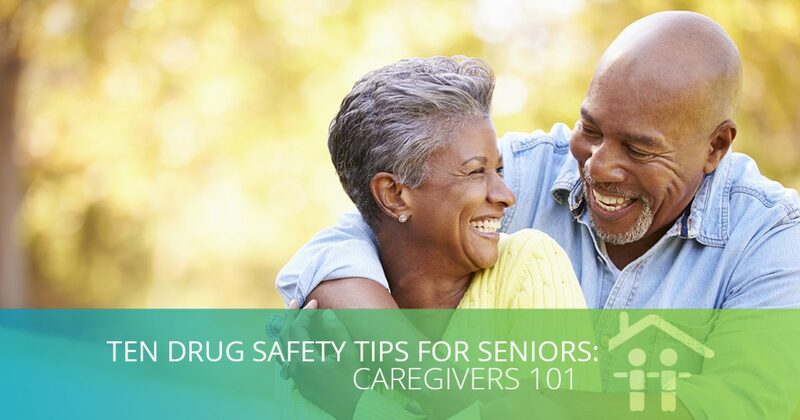 No matter what time of year, seniors are much more likely to suffer from mishandling their own prescriptions, so getting organized about drug safety can help caregivers, home care aides and loved ones prevent drug misuse and dangerous mistakes. Keep all prescriptions, vitamins, supplements, and OTC remedies in one place. Don’t make that ‘one place’ the medicine cabinet in the bathroom! Most drugs require a cool, dry place to stay stable and effective. Keep a current list of every medication, vitamin, supplement and dosage, so doctors can be sure that new prescriptions don’t interact negatively with what’s already ‘on board’. Use a pill sorter to organize the week’s pills in advance, so nothing gets left out or taken twice. Doctors and pharmacists aren’t perfect, and mistakes happen more often that we like to think. Double-check potential drug interactions yourself with this online database. Be sure the dosage and timing instructions for each prescription are clear. If there’s medical shorthand like ‘PRN’ or ‘BID’, know the difference between as needed and two times per day. Be aware that the pharmacy may have misread the doctor’s handwriting and be sure you know what the dose and timing should be. Use whatever tools necessary to make sure pills are taken at the right time each day. Some choices include a smartphone alarm, a reminder app, a reminder phone call or a home care aide’s assistance. When a new medication is added to the roster, be aware of potential side effects or interactions. Seniors with cognitive issues stemming from Alzheimer’s or dementia may need more hands-on help from a home care aide, since reminders and pill boxes may not be sufficient. Don’t risk running out of daily medications. Going ‘cold-turkey’ by accident is just as dangerous as taking a double dose because of forgetfulness. Set up automatic refills with local pharmacies like CVS or mail order suppliers, and request 90-day prescriptions from the doctor to make the refill schedule less tight. As therapies, doses and prescriptions change, seniors will inevitably accumulate unwanted medications. Remember all the ways you can safely dispose of these medications: the preferred method of official disposal events and official year-round disposal sites, followed by trashing and flushing as last resorts. (If you missed National Prescription Drug Take Back Day last month, the DEA still wants to make it easy for you to dispose of your old prescriptions. Use this link to find a prescription drug take-back site near you that’s available year-round.) 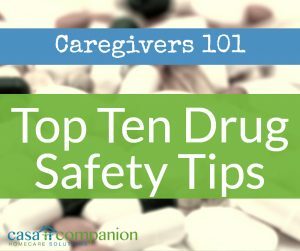 Caregivers, home care aides and loved ones know that responsible and organized prescription drug safety and management is the best way to keep everyone in the household safe.